A utensil to hold and spread liquids or juices over meats and poultry as the foods roast. 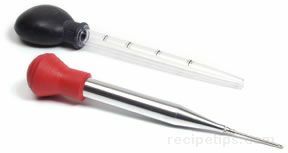 Bulb Basters provide a method of moistening food, adding flavor and creating a glaze or crisp coating during the cooking process. Pan drippings, butter, or sauces can be applied to meat in several ways. The drippings can be spooned over the meat periodically as it cooks, brushed on the surface of the meat with a basting brush, or dispersed over and around the meat with the use of a Bulb Baster. The head of the Bulb Baster is squeezed, creating a partial vacuum, and then the stem or brush is inserted into the juices that may be at the bottom of the pan or held in a container. When the pressure is released on the bulb, the juices are drawn into the stem so they can be transferred to the surface of the meat. Typically, there are several varieties of Bulb Basters available for use, such as the standard open nozzle types or an injector nozzle basters which have a needle-like nozzle. The open nozzles may contain only a round open hole or an end with brushes that disperse the basting solutions. The open nozzle is used to distribute liquids over the outside of the meat while the injector nozzle is best for injecting juices, herbs, wine or other liquids directly into the meat. A dripless Bulb Baster is also available that will retain liquids within the bulb and nozzle, not allowing the liquid to be released unless the Bulb Baster is activated. When selecting, make sure the Bulb Basters can be cleaned easily and that the materials are long lasting.